DeanMurdoch wrote: Spain as in Spain, or Spain as in the Canary Islands are part of Spain? Dunno! But I would think he'd want to keep the Canarius pump primed. @CoachReveno wrote: Flight to Europe just went out to runway and turned back due to "indicator light". Does @JayBilas cover international travel in "Toughness?" Bobby Sharp, listed as a shooting guard, only smaller, but was the player of the year in his junior college basketball conference and is being recruited by the U, according to the story. His ability to shoot the three would help the Pilot cause. Bobby Sharp, who made 50 percent of his 3-point shots while leading conference champion Santa Rosa JC in scoring, has been named Big Eight player of the year. Sharp, who will be in action tonight when his team hosts Chabot in the CCCAA Northern California Regional, averaged 17 points in the regular season. The sophomore was also effective from inside the arc where he connected on 49 percent of his shots, and the free throw line where he nailed 82 percent of his attempts. Two other SRJC men were voted to the all-conference first team — Max Fujii and Connor Gillett. Xavier McCall and Jajuan Hammond received honorable mention plaudits. McCall and Sharp were teammates at Cardinal Newman and Fujii was All-Empire Player of the Year at Analy. Gillett is from La Mirada, and Hammond from Fresno. The Bear Cubs women’s team, co-champions of the Big Eight, are represented by Whitney Edens (Cloverdale) and Arianna Hanson (Rincon Valley Christian) on the all-conference first team. The women’s team will play the first game of the doubleheader tonight at Haehl Pavilion. They’ll host San Jose City College (12-16) at 5:30 p.m. The Bear Cubs (24-6) are the No. 1 seed in the NorCal Regionals. The No. 4-seeded men, sporting a 25-5 record and eight-game winning streak, finished atop the Big Eight. Their game against No. 13 Chabot (14-13) is scheduled to tip off at 7:30 p.m.
Craig McMillan feels his fellow coaches made the right choice in picking Sharp for the conference’s biggest honor. Sharp, who is 6-foot and weighs 170 pounds, is drawing interest from Division I schools and has been contacted by Hawaii, UC Riverside and Portland. Sharp was at practice when he learned he was getting the award. “It’s exciting to be recognized like this,” he said. Sharp believes his game has improved since his days at Cardinal Newman. Fujii, who plays point guard, averaged only one turnover per game and shot 88 percent from the free throw line. Gillett, a power forward, averages eight rebounds a game. DoubleDipper wrote: BTW, if anyone is researching JCs, you might want to checkout Santa Rosa JC in Calif---they have a helluva good team! Thanks for the research, wrv, when I mentioned SRJC on Saturday it was because of a comment I'd heard from Rev, but it was without a name. DD, thanks for the direction because obviously it is why I looked. Whomever they land let's hope it improves Pilot fortunes next year. Conference player of the year? 50% shooting from three-point range? Sign me up! I always find it interesting to see which other schools are interested in the players we may be interested in. If he is throwing out these sorts of numbers, it would seem that some bigger names should be interested in him...? Majoring in communications is his current plan and his academics are in order. Rumor has it that we have only one scholarship to offer. If so, it is not clear that the Pilots will offer Mr. Sharp because apparently Reveno continues to do what his mother told him and "shop around." Rumor has it that we have only one scholarship to offer. Does this "rumor" have sources or is it just from whats been talked about on this page? DTLegend wrote: Does this "rumor" have sources or is it just from whats been talked about on this page? Rumor? I thought it was just basic math. Equals 1 open scholarship. What am I missing? What happened to the Cason slot? PurpleGeezer wrote: What happened to the Cason slot? When I asked for sources I was just infering about Oskars status, because that rumor could add another scholarship. I was curious if wvr had any insight on what that decision may be. DTLegend wrote: When I asked for sources I was just infering about Oskars status, because that rumor could add another scholarship. I was curious if wvr had any insight on what that decision may be. I see what you're saying. DD's post had some insight on that. So, unless there is a surprise (or truth to the Oskars rumor), we have 1 schollie to fill for next year. Any rumor cited by me is no more than speculation from an eye on the program and this website. Don't mean to imply inside knowledge. Maybe I missed it in an earlier post but isnt Santa Rosa JC where Nik Raivio went before UP?? Heck if this kid is half as good as Nik sign me up! Coach Rev made it to Europe. He tweeted that he likes the prosciutto, cheese and bread breakfast. up7587 wrote: He tweeted that he likes the prosciutto, cheese and bread breakfast. It's officially the offseason if we've resorted to these sort of updates. It could actually have been Jamón Ibérica Belloto, which is from a pig raised exclusively on acorns. Quite yummy. Italian Prosciutto is one of those regional marks like French Burgundy in the EU. oldtimer wrote: Maybe I missed it in an earlier post but isnt Santa Rosa JC where Nik Raivio went before UP?? Ha-ha, good memory, especially for an oldtimer, oldtimer. Nik did indeed attend SRJC after playing one year at Northeastern JC in Sterling, CO, but he did not play at SRJC due to a broken collarbone. Fortuitous for UP that he DNP, as it gave him three years eligibility at UP. Specifically the whey leftover from making Parimiggiano Reggiano was fed to the pigs that are used to make traditional Prosciutto so unless it was shipped in from Italy it was probably some other type of pig. I don't know what the regulations for making Prosciutto are these days or if they still feed the pigs leftover whey.... Also, I can't say I've ever had Prosciutto although real Parmiggiano is delicious. 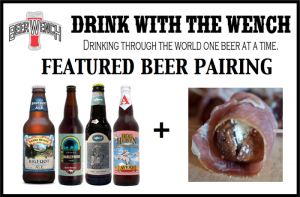 In order to bring this discussion to it's logical conclusion, it turns out that barleywine is recommended as the pairing with prosciutto.